Bring style and fashion into your home with this beautiful and unique decorative accent throw pillow. 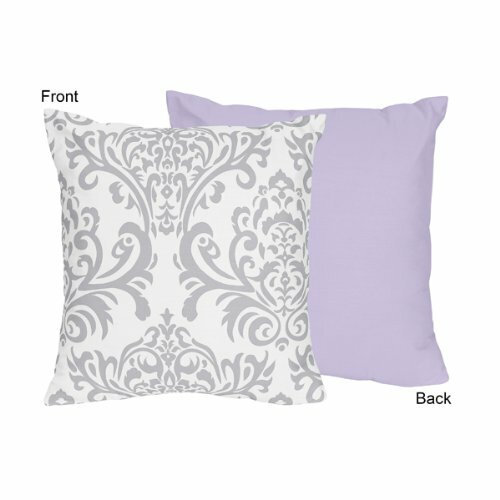 This 100% cotton reversible lavender/damask pillow is both stylish and practical. No need to buy a new sofa or bedroom suite just because you're craving a change. Whether on a bed, chair, or sofa, this large throw pillow is a great and inexpensive way to get that instant makeover. Coordinates with matching bedding sets by Sweet Jojo Designs. Each pillow sold separately. Please Note: This pillow is sold as a single unit - order as many as you need.